It’s been said that every few minutes we take as many photos as all of humanity took in the 1880’s. In the mid 1800’s a photographic representation of reality was considered technological marvel. Needless to say, photography has changed a great deal over the past 150 years. Before camera phones, digital cameras, disposable film cameras or Kodak Brownies, there was the carte de visite — a small albumen print mounted on card stock measuring about 2″x3.5″. These small portraits about the size of a modern business card were traded among friends and family. Many times these small portraits ended up being pasted into blank books – the debut of the photo album. The popularity of the carte de visite slowly waned in favor of the cabinet card. 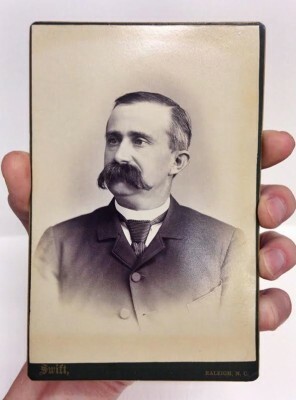 These larger portraits measuring 4.5″x6″ were also albumen prints on card stock, but since they were larger they were often displayed in cabinets — hence the name. 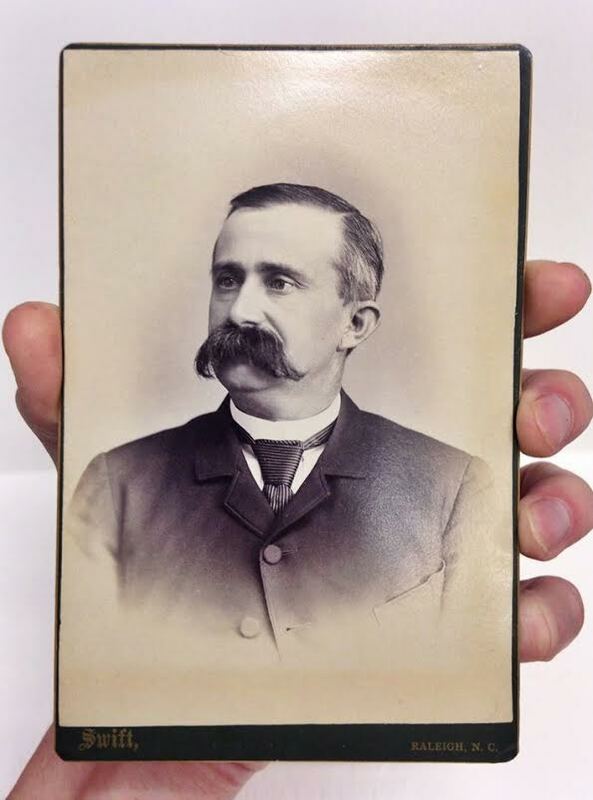 Pictured is a wonderfully preserved cabinet card ca. 1885 from the studio of George W. Swift at 119 Fayetteville Street, right about where the Alexander Square parking deck is today. The man depicted on the card is Dallas T. Ward who played a small, but interesting, role in Raleigh history and the Civil War. In April of 1865 at 19 he was a conductor for the Raleigh and Gaston Railroad when he was tasked with crafting the actual truce flag for the surrender of Raleigh to Union forces. It was to be immediately taken by train to the camp of General Sherman near Clayton. Making the flag wasn’t as simple as he’d expected, “white cloth was exceedingly scarce” he recounted. After knocking on the doors of nearby houses, he eventually found a square yard of white cloth. He then tied it to a spear and set off by train with several governors and dignitaries toward Sherman’s camp. Ward and his party were cordially greeted by Sherman and the truce flag was accepted. After dinner and a night’s rest, Sherman wished them “a safe trip back to Raleigh”. 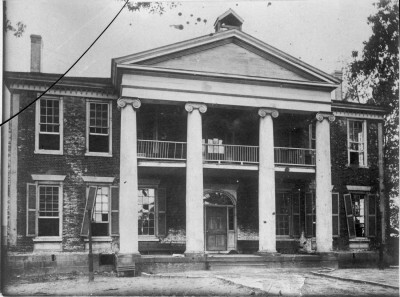 Shortly thereafter, Sherman’s army occupied Raleigh and set up his headquarters in the old Governor’s palace at the opposite end of Fayetteville Street from the Capitol, the present day location of Memorial Auditorium. 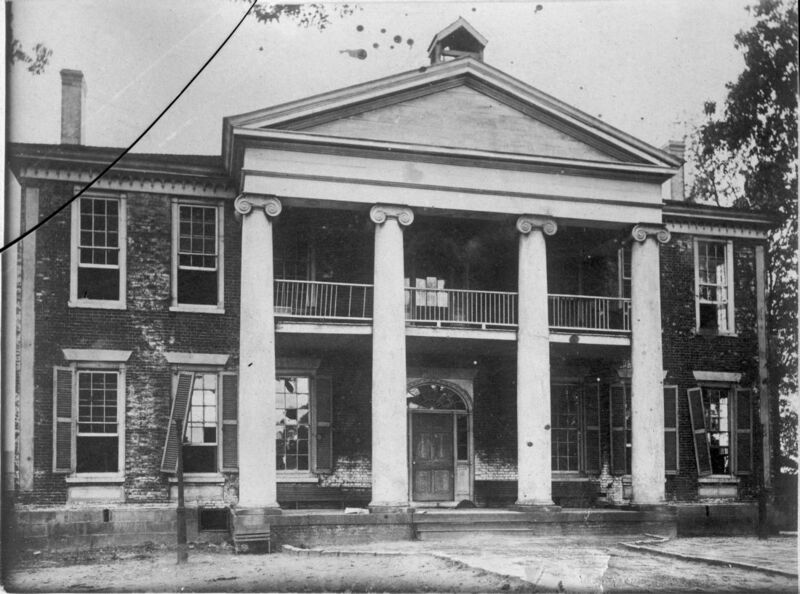 Governor’s Palace at the southern end of Fayetteville Street opposite the State Capitol c. 1840. From the Albert Barden Collection, State Archives; Raleigh, NC. Raleigh would very likely have a different landscape if we hadn’t surrendered to Union forces. Many people who know the story of Dallas T. Ward half-jokingly credit him with saving Raleigh from total destruction — and while that may not be completely true, he deserves a little recognition for the mustache alone. Originally published in the Triangle Downtowner Magazine, issue 110. Is it true that it was the occupation of the Governor’s mansion by Sherman that led to it’s demise ? It was pretty neglected when Sherman decided to set up shop in there. Then he left it in worse shape. After that, it was abandoned and for the next 26 years governors stayed at the Yarborough House on Fayetteville Street.